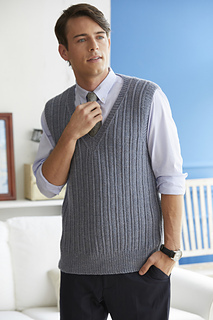 This vest sports an easy fit and plenty of plush texture. What looks like a basic garter rib pattern actually has a fun twist: The single stockinette stitches are knit into the row below the needle, which makes them stand out against the reverse stockinette stitches that border them. K1, p1 ribbed trims add polish.